Specialist Lifting Solutions are based in Cirencester Gloucestershire and we offer a same day courier service covering Gloucestershire, Wiltshire, Oxford, Bath and Bristol. For urgent deliveries, we understand that only dedicated couriers will do. We promise that when you request an urgent dedicated delivery, our couriers will collect and deliver your goods and no one else’s to ensure the fastest possible service is achieved. Our aim is to collect your goods within one hour of your call. Your goods will then remain on the same vehicle throughout their entire journey, and have the benefit of being fully insured by Specialist Lifting Solutions up to £20,000 per item from collection until delivery. We can deliver your goods throughout the UK mainland, and also offer a one or two man delivery service for heavier items. For peace of mind for same day deliveries, we will also provide you with instant confirmation of collection and delivery as it happens via telephone or email. 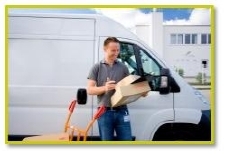 Our door to door courier service can also provide you with a hard copy proof of delivery via fax, post or email. If you are a large corporation or a smaller business that is looking for a reliable and personal courier service that cares about your image and your goods then look no further. If you are a private individual that needs something collected or delivered, large or small, and wants the peace of mind that it will be treated with due care and attention throughout its journey from A to B, without being offloaded at various depots en route, then you have come to the right place. Through utilising the very latest in satellite technology, Specialist Lifting Solutions can maintain constant communication with all of our couriers - all of the time. This enables us to provide you with a dedicated control centre that can track your consignment right through from collection to delivery. Collecting and delivering throughout the UK, we at Specialist Lifting Solutions are able to tailor a solution to meet all your delivery requirements. We provide our services in the following locations; Swindon, Cirencester, Stroud, Tetbury, Nailsworth, Malmesbury, Oxford, Cheltenham, Bristol, Chippenham, Hereford, Birmingham, London, Cardiff, Worcester, Newbury, Wiltshire, Somerset, Bath, Corsham, Trowbridge, Gloucester, Coventry, Surrey, Wokingham, Solihull, Reading, Guildford, Yate, Devises, Maidenhead, Uxbridge, Fichley, Croydon, Buckinghamshire.